This great egret wading near a mangrove tree makes a serene scene. When you take a careful look, can you see the circular bands of light reflecting up on the egret? The great egret stands alone in the still water, accompanied only by his reflection. My favorite part of this image is the composition, in which the strong vertical lines complement the horizontal lines. In addition, the generous amount of negative space adds to the simplicity and the serenity of the image. The color palette is also simple and natural. What do you see? What do you like? 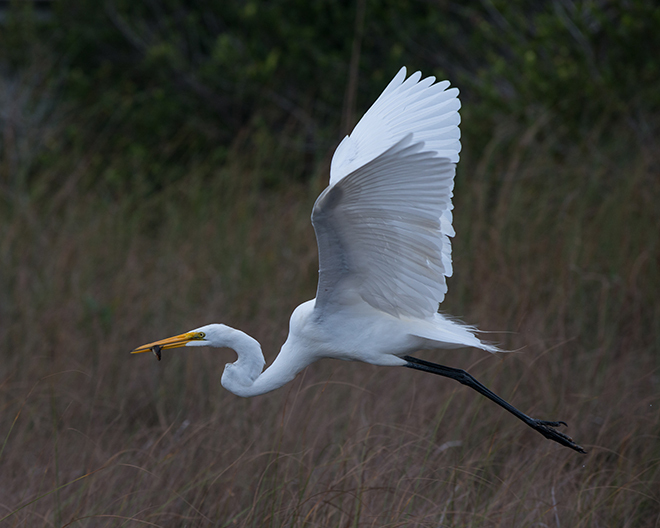 My camera settings were ready to capture this graceful Great Egret in flight when he lifted off. You need a fast shutter speed, the bird in focus, and a proper exposure (difficult when the bright sky is the background). I was really excited to see this egret with two wing positions and water dripping off his feet. Since the sky was cloudy, I had my ISO set to 400. My Nikon 70-200 lens was extended to 200 to isolate the bird without moving too close to disturb him. I had my Nikon D800 set to Aperture Mode and set the aperture to f/5.6 to keep the bird in focus if he moved a bit closer or farther from me. This setting gave me the balance between wide depth of field and enough light to yield a fast shutter speed (1/1,000) to freeze action. I also employed the fast continuous shutter mode, so my camera would shoot multiple exposures with one long depression of the shutter button. Of course, you have to make these choices ahead of time, so when the bird takes off, you can pan and press the shutter button. 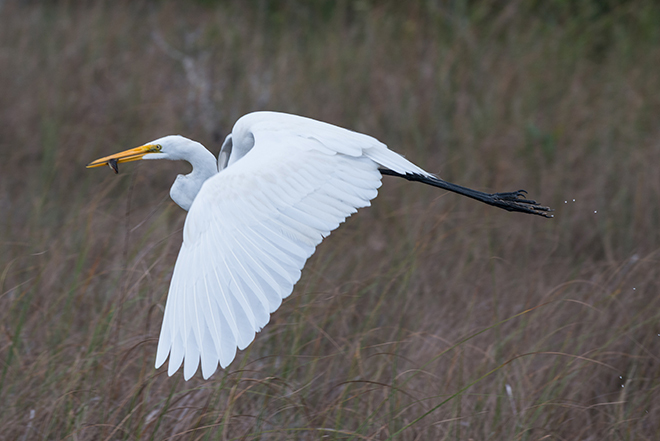 Egret in flight with its prey. Such a beautiful fan of white feathers. 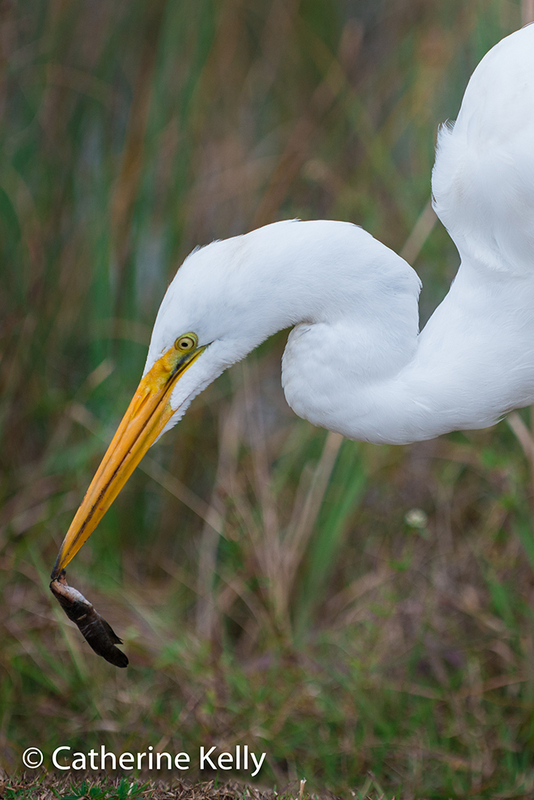 Captured this Great Egret in the Everglades catching and eating his dinner — a wiggly creature from the wetlands. It was a big morsel to swallow whole. Nearly the last photo of 199 images shot at Shark Valley last Saturday.